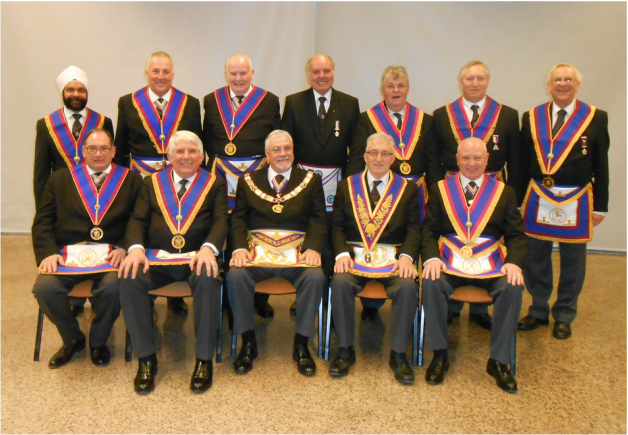 ​ The PGM; Past APGM Bob Potts and 11 other Active Provincial Officers and brethren of the Province represented Essex at the recent District of Spain meeting held in Benidorm. The District of Spain is one of those "Districts and Lodges Overseas" administered by GLMMM and referred to in the title of the constitutions thereof. They took off from Southend at 7am on the grey Friday morning of the 5th February and landed in a much more pleasant Alicante at 1030am, there followed a long coach ride to the Grand Bali Hotel in Benidorm. After some refreshments (I think that's a simile for cold beer), the Brethren changed to formal attire and attended a Scottish Rite Ceremony of the Mark Degree carried out by a Royal Arch Team from a Scottish Lodge. It was very strange, although historically accurate pre-amalgamation of the Antients and Moderns, seeing a Mark Degree been conducted in Royal Arch Regalia, another daily advancement in masonic knowledge. Who says there are only 3 degrees and The Holy Royal Arch in Freemasonry! The District meeting took place on the Saturday morning followed by a marvellous Festive Board. During the evening all went to a local bar to watch the rugby (more beer no doubt). Now, for all you who enjoy the comedy series "Benidorm", I am told that the team had no cheesy fake tans; beer bellys or speedos on display (or at least no remaining photographs). All those attending paid for their own flights and hotel accommodation and those not invited as official guests of the host Province also paid for their own festive board meal.A great time was had by all.